Puay Khoon is a partner with the Financial Services tax team of PwC Hong Kong. She specialises in the asset management industry and banking and capital markets industry. 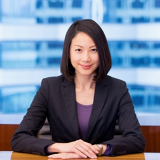 She has extensive experience serving China based as well as global and regional financial services clients. Some of Puay Khoon’s clients include sovereign wealth funds, global, regional as well as boutique fund houses, investment banks, commercial banks, securities houses, etc. She has assisted many private equity and hedge fund clients establish their fund and fund management structures and is experienced in advising on investment structures, financing structures, structured finance products, tax compliance work, health check, etc. Puay Khoon has been involved in transaction and deal related work such as tax due diligence, merger and acquisition, etc. She has assisted a number of private equity funds to apply for treaty benefits in China and repatriate investment proceeds out of China. Puay Khoon is also active in the corporate treasury space. She has advised clients on setting up corporate treasury centres in Hong Kong and has worked with banks and government authorities to promote the corporate treasury centre inventive to corporates. Puay Khoon has been practicing tax for more than 13 years. In addition to Hong Kong and China tax, Puay Khoon is also familiar with Singapore tax having practiced tax in each of the above jurisdictions. Prior to joining PwC, Puay Khoon practiced tax with Arthur Andersen and then BNP Paribas in Singapore. Puay Khoon is a CFA charter holder and a Chartered Accountant.